including a Veteran’s Parade and other activities 20-22 June 2019. Stay tuned and come back here for more details as things progress. 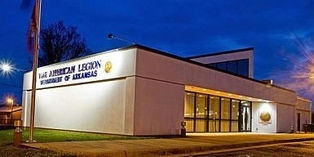 Click for more on The American Legion’s Legacy! U.S. Senator John Boozman highlights the many milestones of The American Legion since its inception while honoring the men and women who have served in the armed forces of our country on Monday, March 11. 2019. Senator Boozman also mentions many of the noteworthy achievements and accomplishments of The American Legion Department of Arkansas and its members through the years, as part of the 100th Centennial Celebration of The American Legion. As part of the 100th Centennial Celebration of the American Legion in the Great State of Arkansas, Governor Asa Hutchinson has graciously recognized Arkansas Legionnaires by providing an official Proclamation honoring those who have served in the armed forces of our country. Please share this historic Proclamation with fellow veterans, as well as the political leaders in your local communities, so this historic milestone of 100 Years of continuous dedication and service to our freedoms in our nation's history is not overlooked or forgotten. Furthermore, please use this Proclamation to solicit assistance from your local communities to help promote the understanding of the many sacrifices made by Legionnaires and their families! On 15 March, as part of the Proclamation of the Governor of Arkansas for the 100th Anniversary of the existence of the American Legion, ALL bridges crossing the Arkansas River will be lighted in Blue and Gold in Honor of the 100 years of The American Legion serving the Veterans and Communities of Arkansas. Our Thanks to the Pulaski County Road and Bridge Department for their help in the County Controlled Bridges and also the Little Rock Convention and Visitors Bureau in their help in lighting the Downtown Little Rock Bridges for that day. 100th Anniversary Legion Celebration on 7 March starting at 17:30 Hours. There will be Hot Dogs, Hamburgers, Cheese Dip and other foods on hand for the Celebration. Veteran’s Memorial Building in Dewitt Arkansas located AT: 112 N. Main Street. 100 years of Service to Veterans and the Community. It will be on Friday, 15 March from 12-4pm. A complimentary lunch will be served. We will be honoring local businesses that have helped the Post by their generous donations. We will also be displaying a history of our Post, as well, displaying for the first time a Honor Roll Wall of our local casualties from the Civil War- through to the Iraq/Afghanistan Conflicts. will be holding a Centennial Celebration Event on 16 March from 1PM to 3 PM. the local NROTC with information displays and finger foods and attendance prizes. will be on 17 March starting at 12:00 Noon. Our St Patty's day tradition of Cornbeef and Cabbage will be served. The Wall That Heals is coming to Arkansas! the Vietnam Wall Memorial in Washington, DC, and Traveling Educational Center. The event is part of Post #17's observance of the American Legion 100th Centennial Celebration.